Fasco pneumatic strip nailers & Scrailers have Multi-magazine - to supports three different fastener types: strip nails, SCRAIL, and concrete pins. Fasco pneumatic strip nailer & SCRAILer. 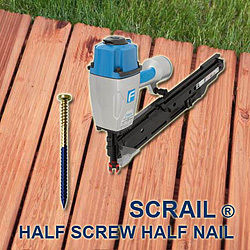 Uses 20 degree strip nails, SCRAIL®, and concrete pins up to 3-1/2" length.